Since the early 1900s, the University of Florida has been sharing research discoveries and education programs with the people of Florida through its Extension Service. Faculty from the Florida Agricultural Experiment Station organized farmers' institutes to demonstrate the latest techniques in agriculture and home economics to Florida's rural families. 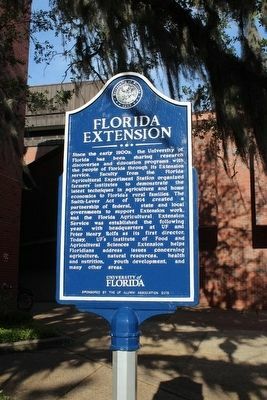 The Smith-Lever Act of 1914 created a partnership of federal, state and local governments to support Extension work, and the Florida Agricultural Extension Service was established the following year, with headquarters at UF and Peter Henry Rolfs as its first director. Today, UF's Institute of Food and Agricultural Sciences Extension helps Floridians address issues concerning agricultural, natural resources, health and nutrition, youth development, and many other areas. Erected 2015 by The UF Alumni Association. traveling north. Touch for map. Located in front of Rolfs Hall. Marker is in this post office area: Gainesville FL 32603, United States of America. Touch for directions. Other nearby markers. At least 8 other markers are within 2 miles of this marker, measured as the crow flies. Walker Hall (approx. 0.2 miles away); University of Florida Historic Campus (approx. ¼ mile away); Bryan Hall (approx. 0.3 miles away); Gatorade's Birthplace (approx. 0.3 miles away); Alachua General Hospital (approx. 0.7 miles away); Gainesville's Railroads / Past Railroads of Gainesville (approx. 0.9 miles away); Mt. Carmel Baptist Church (approx. 1.1 miles away); Josiah T. Walls (approx. 1.1 miles away). Touch for a list and map of all markers in Gainesville. More about this marker. 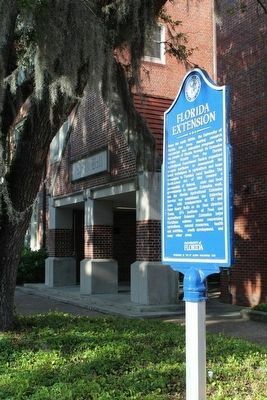 Marker is part of the University of Florida marker series. More. Search the internet for Florida Extension. Credits. This page was last revised on June 16, 2016. This page originally submitted on April 12, 2016, by Tim Fillmon of Webster, Florida. This page has been viewed 217 times since then and 6 times this year. Photos: 1, 2. submitted on April 12, 2016, by Tim Fillmon of Webster, Florida. • Bernard Fisher was the editor who published this page.